Mining has been traditionally considered as a sector of significance for both economies of India and South Africa. The sector’s GVA accounted for 3.8% of India’s GDP in FY2016. In 2017, the industry constituted 6.8% of the South African economy, contributing $ 4.77 bn to the Gross Domestic Product (GDP). The importance of mining to the economies, however, has now moved from being merely an economic activity creating jobs to being a domain marked by emerging themes such as sustainable development, inclusive growth and innovation. As globally we are proceeding towards preparedness for industry 4.0 and sustainable growth, mining will be an industry of focus and high impact for both India and South Africa. In early 2000s, Canada’s Goldcorp, a gold production company, made available in public domain, company’s proprietary geological data. This was followed by a challenge of ‘virtual prospecting’ for identifying undiscovered reserves. The challenge led to the discovery of 110 new exploration targets and production of $ bn in gold. Role of digital and emerging technologies in mining will increase in the years to come. Value additions of disruptive technologies are likely to be most prominent in spatial operations of mining such as exploration. South Africa’s Mining User Group met in Pretoria in 2016 to discuss the future of mining in the age of digital and interesting insights emerged from the discussions. In future, Geographic Information Systems (GIS) will act as data integration platforms and assume relevance as an information management and distribution tool. It will be able to answer in cost-effective ways, questions such as location of mines, depth of reserves, risks of over/under mining, incident mapping and socio-economic impact assessment. Computational analysis could extract valuable insights from collated geological data. The key takeaway for policy makers in this regard is to develop policy prescriptions which incentivize private sector to adopt technology and big data solutions for managing the vast amount of geological data. The policy makers of India and South Africa may consider developing an enabling ecosystem, working closely with other ministries, which promotes digital, adoption of Industry 4.0 and elements of crowdsourcing exploration in the mining sector. The Indian Ministry of Mines has already initiated the efforts by working with the Ministry of Defence and making available ~6,000 digitized reports pertaining to mines. When it comes to innovation in mining, India and South Africa have lessons to learn from the more advanced peers like Canada and Australia. The silver lining is that the BRICS economies have in this not just an opportunity to innovate, but disrupt the industry, leapfrogging into the future of mining. The promising developments in innovation are already in the right direction. In 2016, the Chamber of Mines of South Africa and The Innovation Hub, a subsidiary of the Gauteng Growth and Development Agency (GGDA), ran an open innovation challenge: Advanced Orebody Knowledge challenge. The objective was to encourage innovations that ‘see through the rock’ i.e. identify and understand the composition of ores for higher returns on investments in mining activities. India is a not far behind in boosting innovation. The Digital Technology in Mining Report, 2017 by Accenture shows that private sector is making large investments in mining operations target robotics and automation (pegged at 54% of the total spend), followed up by the spend on remote operating centres, drones and wearing technologies. In September 2017, Anil Agarwal, founder of Vedanta Resources was reported to create a 5,000 cr angel fund which aims to support metal-based start ups developing products for the automotive and construction sectors – creating the demand pull for the mining sector. The mention of mining is typically associated with the negative externalities. Nevertheless, the acknowledgement that natural resources feed into all other industries, make mining, and more importantly sustainable mining, indispensable to economies reliant majorly on the activity. Both public and private players from India and South Africa are contributing to making mining more socially and environmentally responsible. In South Africa, Anglo American Platinum, one of the world’s largest mining companies, developed Alchemy, a community-based empowerment scheme in mine host communities and key labour-sending areas. Interestingly, Anglo American Platinum was recognised as the best performer in 2013 and 2014 by the Johannesburg Stock Exchange’s Socially Responsible Investment Index. In India, in addition to environmental impact assessments and the initiatives under the sectoral legislation, the private sector is sensitized, and several players report their sustainability performance in addition to financial reporting. An empirical study undertaken by the journal ‘Current World Environment’ concluded that sustainability reporting by mining companies has a direct impact on maintaining a corporate’s goodwill, and such public disclosures drive companies to act more responsibly. Changing gears, other seminal works in the recent times that brought out the concerns and possibilities regarding sustainability and mining was the World Economic Forum’s scoping report in 2015 titled ‘Mining & Metals in a Sustainable World 2050’. Globally, the sustainability aspects relating to mining revolve around well-recognized drivers – environmental, societal, and geopolitical. However, interestingly, the report lays a lot more stress on consumption end and makes a compelling case for the circular economy and the value of recycling. What remains to be seen is in addition to existing regulatory mechanisms to drive sustainability in mining, how can the mining economies like India and South Africa work together in driving sustainability from within the industry voluntarily and across related industries like metals and mining. At this stage, it is interesting to observe how all three emerging themes in mining are interlinked and fed into each other. 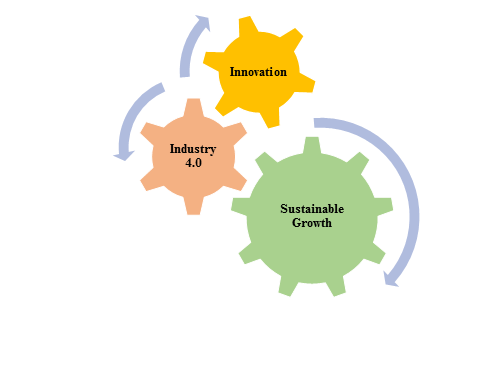 Innovation leads to the adoption of industry 4.0. Smarter technologies, robotics and automation not only make mining safer reducing casualties but also develop avenues for optimal mining and recycling, minimizing environmental after-effects and driving sustainable practices. Private capital, which now is looking for triple bottom more than ever before, is more likely to trickle down into mining as the sector becomes more sustainable. It is the initiation of this chain reaction that policymakers need to focus on and actively work towards. Firstly, in a capital-intensive sector such as mining, companies seldom have free capital to prioritize and invest in digital initiatives. The Governments can work together in promoting digital innovation together by the creation of a joint fund or bringing together private parties to drive the innovation through accelerator programmes for the common benefit of the industries in both countries. With the centrality that mining has in both economies, a joint initiative provides economies of scale and adequate scope of bootstrapping, alpha and beta testing. Technologies with established applications in other domains need to be explored for the utility in the mining sector. For instance, virtual reality can revolutionize skilling in the sector with real-time simulations closely replicating mine conditions. Targeted hackathons or start-up challenges driven by inter-ministerial committees in both countries could be a great starting point. Secondly, the Governments can explore and promote innovative business models drawing from the experiences of Canada and Australia. These can specifically be targeted towards specific parts of the value chain of the mining operations where the Government intends to initiate private participation and make the segment more lucrative. For instance, mineral exploration and prospecting could be an area of focus. Since exploration is a high-risk and speculative activity, a vibrant ecosystem of ‘junior companies’ i.e. those who have no revenue as such from an operating mine, may be encouraged to undertake exploration. In major resources driven economies like Australia and Canada, junior exploration companies drive the initial exploration stage – research shows that up to 60% of the mineral exploration in Australia in the period between 1960-2002 was undertaken by such companies. These companies partner with other bigger companies for funding, more focused exploration and as a point of sale for the mineral discovery data. Tax structures such as ‘flow-through-shares’ (FTS) can form crucial instruments to ensure access to capital for exploration companies. An exploration company can issue FTS at a premium to raise funds and the shareholder can utilize to claim deductions on eligible exploration expenses of the issuing company. Holders of FTS also receive additional tax credits such as mineral exploration tax credits. In this manner, investments into FTS reduces Canadian tax incidence on an investor. While India is yet to nurture its own ecosystem of junior miners, South Africa looks forward to reviving the same. This brings out a good opportunity for the countries to partner and learn from mutual experiences through adoption. Lastly, the economies need to work together to develop an enabling environment where the industry self-governs and regulates itself to march towards sustainable growth. Any policy mandate of sustainability, for instance, contribution to the District Mineral Foundation in India, is met with vanilla compliance, but does not create a culture of sustainability as such. The primary sustainability drive is led and operationalized by the Government. However, for a continued, sustained, and voluntary commitment to sustainability to the private sector, the industry may need the right push. A good case in point is the ‘Towards Sustainable Mining’ (TSM) initiative of the Mining Association of Canada (MAC). TSM is a mining sustainability standard developed by the industry in Canada which requires mining companies to conduct an impact assessment of facilities and their sustainable footprint such as tailings management, community outreach & safety, biodiversity conservation etc. The reports are publicly available and are verified every 3 years for veracity. TSM has been adopted by the mining associations of Finland, Argentina, Botswana and more recently, Philippines in December last year. The formal recognition of such self-governance industry codes by giving the complying members preferential rights in participation in mine auctions, for instance, could help standards percolate seamlessly in the industry. The Governments and the mining companies, especially those present in both India and Africa, can seize the opportunity to create or adopt standards and customize them for their economies. To conclude, the true potential of mining in the changing times is yet to be realized and India and South Africa can work together to realize the same.